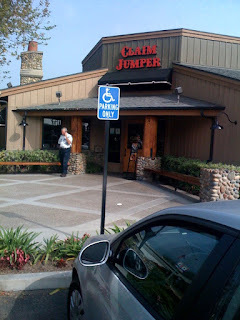 I've been obsessed with Claim Jumper for years, but haven't been able to get back to one since 1994. I don't know what it is about this place - there are things about it that remind me of my most-hated restaurant, Cheesecake Factory, like the overly large portions, and notably the wait times and crowds for what is obstensibly a family style casual dining chain, which I think is rediculous. I think I hit the sweet spot betwen lunch and dinner today, walked right in and was seated. But somehow, Claim Jumper puts it together right, at least for my brain. It was everything I expected for a quick lunch on the way home from Glendora and after 15 years.